Kobichi Vadi that is made in traditional Maharashtrian Style. 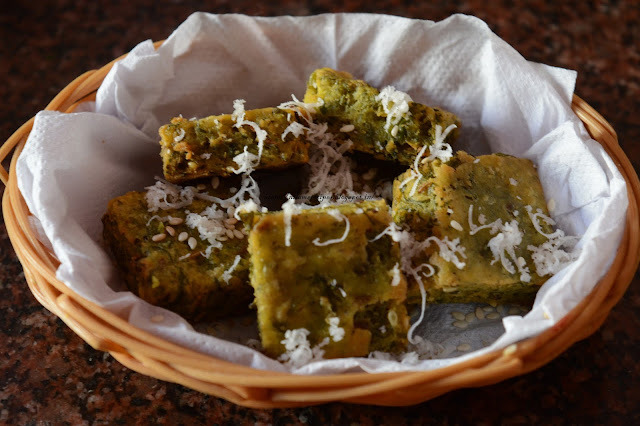 The cooking method of this Kobichi Vadi is very similar to that of Kothimbir Vadi. A delicious way to include cabbage in your everyday menu, especially if you are a cabbage hater! These crispy fried Kobichi Vadi is not only hard to resist but also low caloric if shallow fried or baked. The hint of lemon juice enhances the flavor of these vadies. Steamed & fried, these are an absolute delight with coriander/mint chutney or ketchup. For similar recipes, try: Vegetable Vada, Palak Kobi Vadi, Palak Vadi, Kothimbir Vadi, Alu Vadi. In a mixing bowl, add besan, Rice Flour, chopped cabbage, coriander leaves, red chili powder, ginger garlic paste, sesame seeds, cumin seeds, hing, turmeric powder, lemon juice, salt and mix well. Pour the batter on a greased plate. In a steamer, add water and cook till it comes to a boil. Place the plate and steam it for 10-15 minutes on medium heat. If you do not have steamer, you can use a pressure cooker but do not put whistle. Slides the vadi pieces into the pan. Fry till they turn golden brown and crisp from both the sides. You can also shallow fry, if you want less oil. 1) In a mixing bowl, add besan, Rice Flour, chopped cabbage, coriander leaves, red chili powder, ginger garlic paste, sesame seeds, cumin seeds, hing, turmeric powder, lemon juice, salt and mix well. 2) Add enough water to make a thick batter. 3) Pour the batter on a greased plate. 4) In a steamer, add water and cook till it comes to a boil. Place the plate and steam it for 10-15 minutes on medium heat. If you do not have steamer, you can use a pressure cooker but do not put whistle. 5) Check with a knife. If the knife comes out clean, it is cooked. Allow to cool and cut into square shape or diamond shape as per your choice. 6) Heat the oil for deep frying in a pan on medium flame. Slides the vadi pieces into the pan. 7) Fry till they turn golden brown and crisp from both the sides.You can also shallow fry, if you want less oil. Serve hot with green chutney or tomato ketchup.